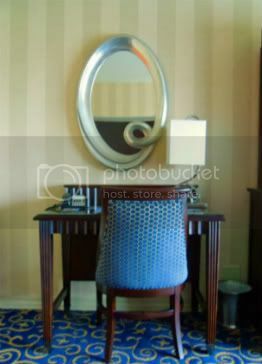 AAA Rating: In August 2011, the hotel received a AAA 4-Diamond rating for the first time. 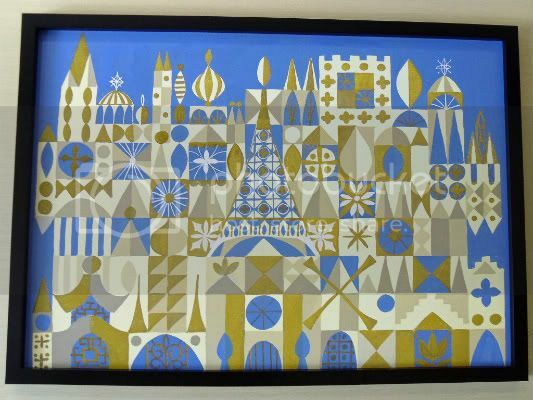 The Disneyland Hotel is the first hotel in the history of the Disney Parks & Resorts universe (although originally it was owned and operated by Hollywood producer Jack Wrather, and eventually bought by Disney). 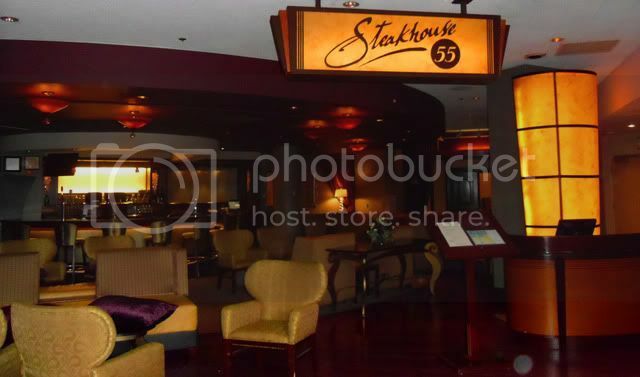 The hotel has been remodeled numerous times since its original opening; in present day, none of the original opening day buildings remain. 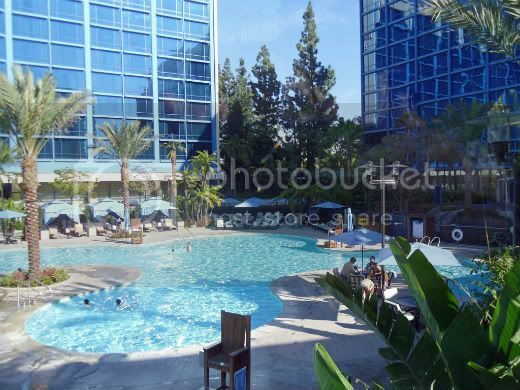 Currently the Disneyland Resort comprises three towers that offer standard rooms and larger suites; a conference/convention center; dining, shopping, a pool area and other recreation. 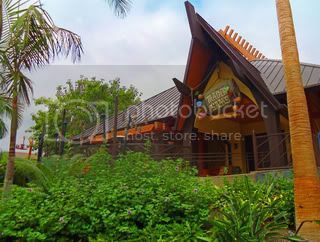 Its just a short ten-minute walk between the Disneyland Hotel and both Anaheim parks: Disneyland and Disney California Adventure. 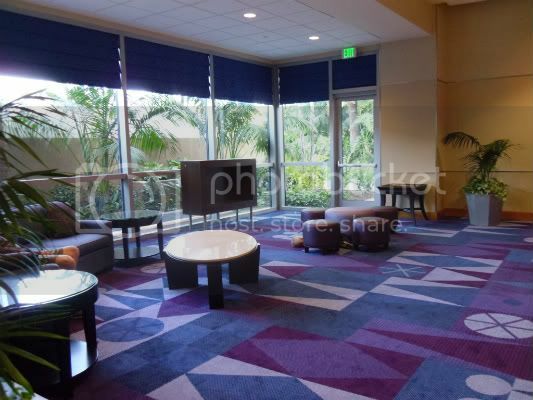 Additionally, the hotel is adjacent to Downtown Disney in Anaheim, and a short walk to 1 of 2 Disneyland Monorail stations (the other one is located inside of Disneyland). 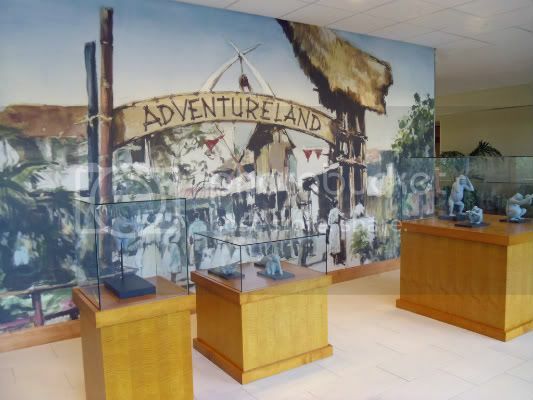 A resort-wide refurbishment program began in 2009 and is scheduled to be completed by the end of 2011 (partially in preparation for the re-introduction of the remodeled Disney California Adventure park, and partially because it was long-past due). 	Redecorated standard rooms with Queen size beds, flat-screen TVs, and completely updated furnishings, fittings, carpets, etc. 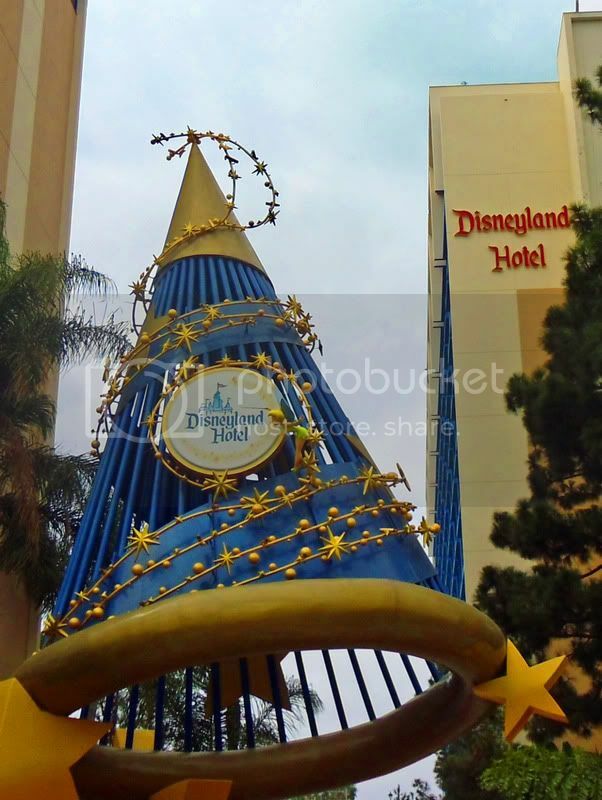 	Re-theming and re-naming of the three hotel towers. 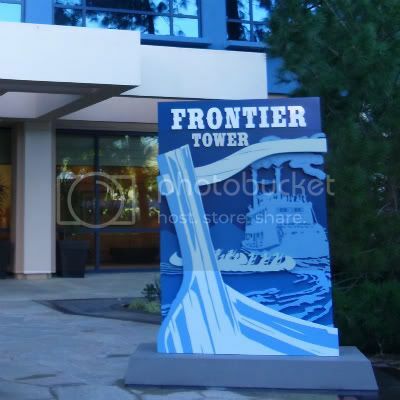 The Towers are now named Frontier (south), Adventure (east) and Fantasy (north / lobby check-in), and each Tower lobby features décor appropriate to the theme. 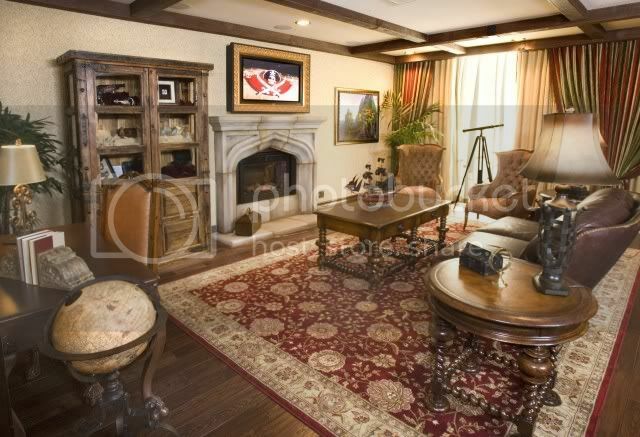 	Addition of themed suites, including Frontier, Adventure and Fantasy suites (to complement the existing Mickey Mouse penthouse suite). 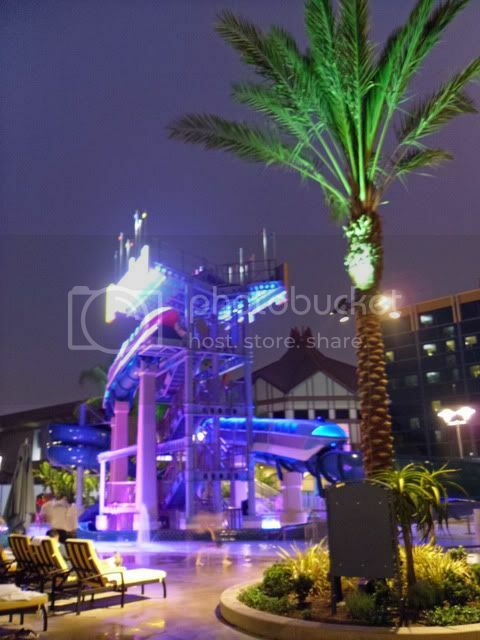 	Remodeled pool and recreation area, which includes two new water slides that feature original Disneyland park signage at the top. Each of the two slides tunnel through a monorail "train." 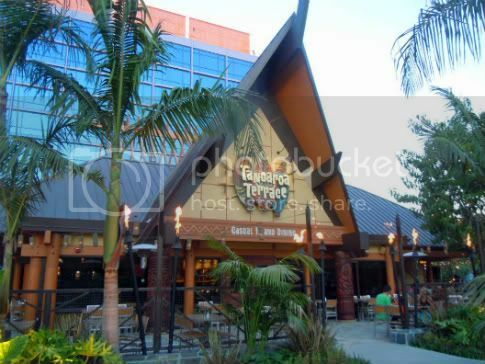 	Two new dining locations, both featuring Tahitian architecture from the 1950s and 1960s: Tangaroa Terrace is a counter service restaurant that serves casual dining, and a new bar, Trader Sam's Enchanted Tiki Bar (based on the Jungle Cruise's head salesman, Trader Sam). 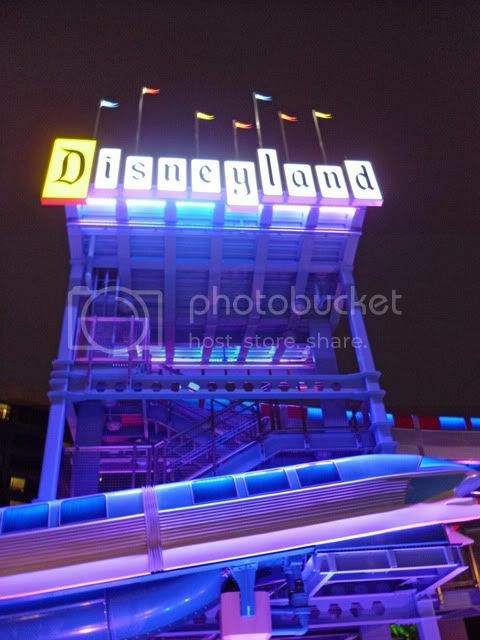 Essentially, the remodeled new look seems designed to invoke a nostalgic, retro/modern feel, featuring fans favorite aspects of the original Disneyland Park, complete with a kitschy 1950s inspired Disney blue color and tiki-themed recreational touches. Rooms are officially available from 3pm but you can check in at the front desk as early as you like. 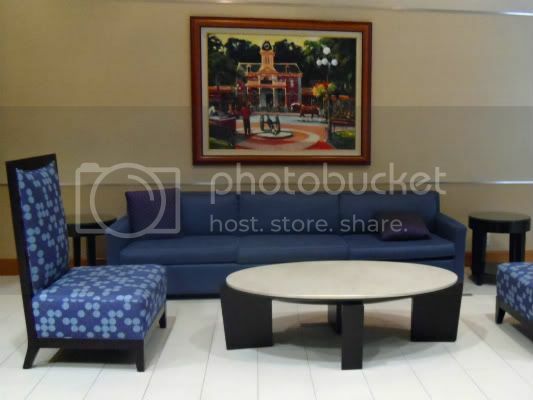 You may get lucky and find that a room happens to be ready earlier, or otherwise Bell Services can store your bags while you head off to enjoy the hotel facilities or the theme parks. Check-out is by 11am, although you can request a free later check-out time (up to 12 p.m.) as long as the room is not need urgently for other guests. Again, Bell Services will store your bags until you are ready to depart. 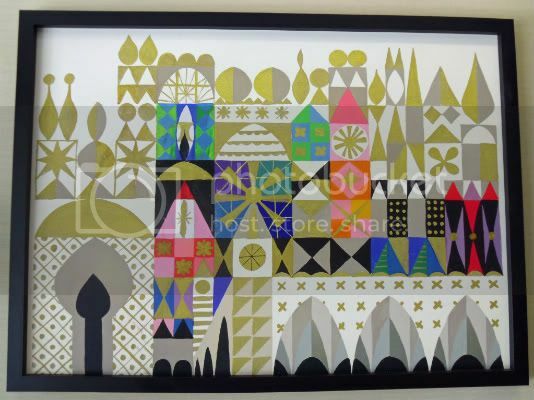 What is the layout of the hotel? 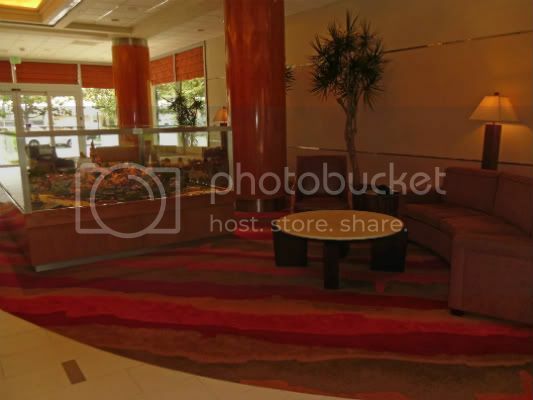 The layout is basically a self-contained square, formed by the hotel towers and conference areas, and containing dining and recreational areas within. 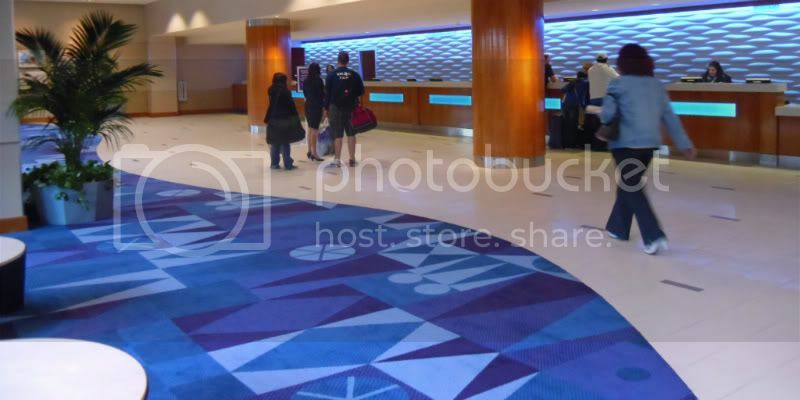 The main lobby / registration / check in is located on the 1st floor of the Fantasy Tower. There are now five room categories: Standard, Resort View, Pool View, Concierge and the Suites. 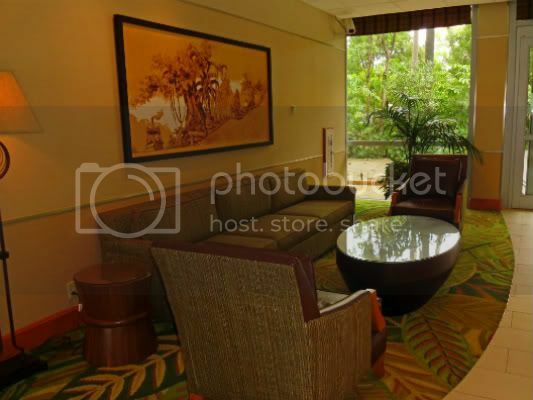 Standard View rooms can overlook woods, courtyards, garden areas or parking lots. Pool View gives you a view the square. 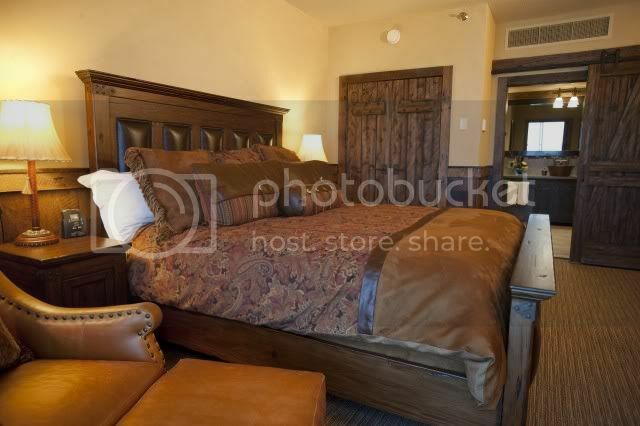 King Bed rooms contain just one King-size bed instead of two queens and are located throughout the resort. 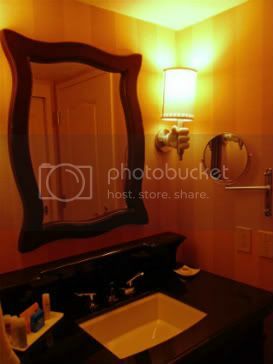 Disability Accessible rooms are also available. Suites feature 1-, 2- and 3-bedroom configurations. 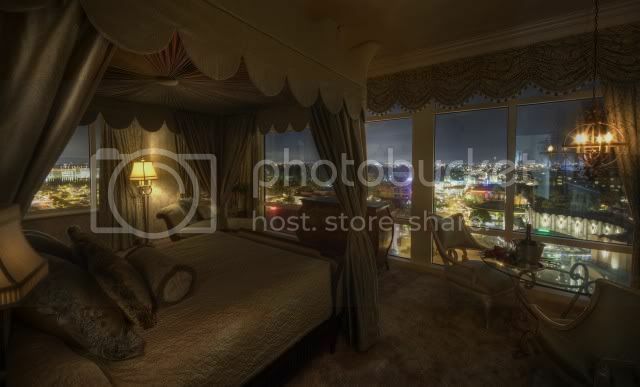 The Suites are located in different Towers throughout the hotel, often in keeping with that Towers theme. Room prices vary by weekday/weekend, season and room type. 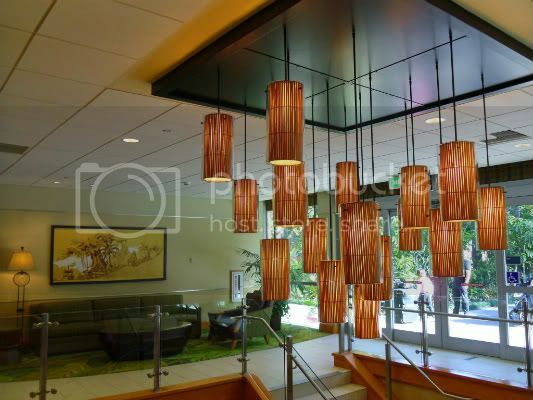 There are likely to be updates to the tiered pricing structure upon completion of the remodel. Some discounts, such as AAA and Disneyland Annual Passholder apply, but these are limited and often sell out very quickly once the rates have been released. 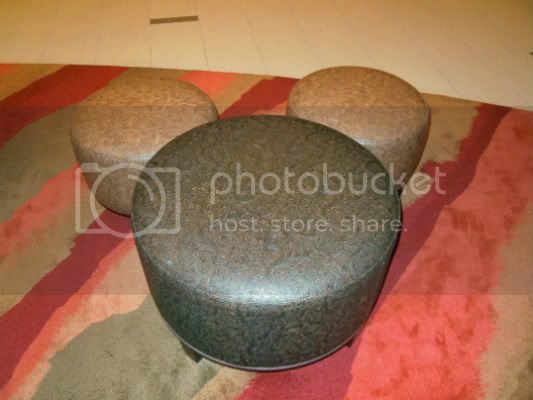 Additionally, The Disneyland Resort hotels recently changed the way they charge for the resort fees. It is now a flat fee of $15 / day and it covers parking, use of the fitness center and daily Internet charges. Can I see Disneyland fireworks from the hotel? Sometimes, but you are better served watching fireworks from inside the park. 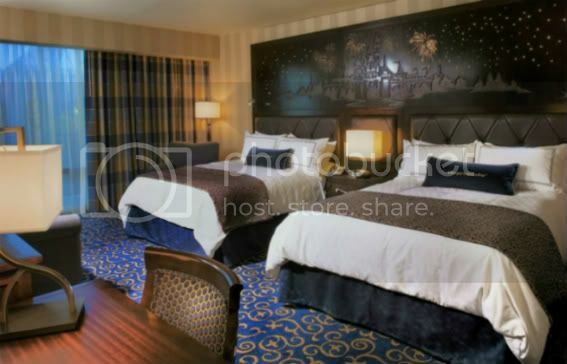 If you are hoping to be able to see the Disneyland fireworks from your DLH hotel room and you are staying in the Adventure Tower (best tower to see them), you MUST be on the Downtown Disney side (not pool view) and 5th floor or higher. 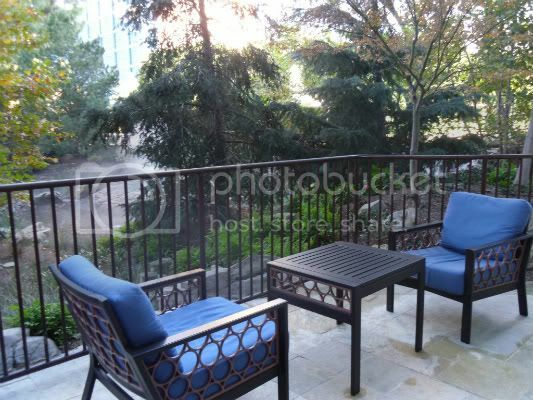 Floors 2-4 have a "treeline" that blocks the fireworks view. Some people prefer to request one Tower or the other and its always best to make your requests along with your initial booking. 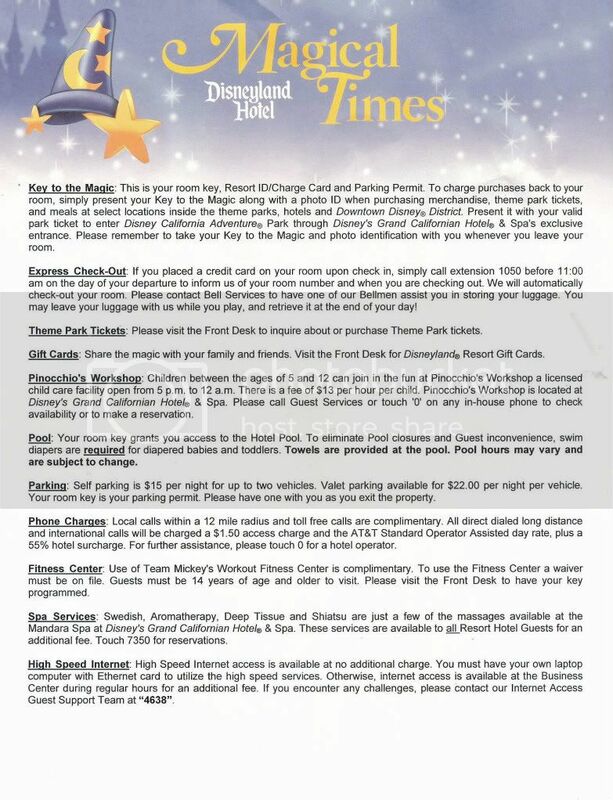 You can also try faxing or phoning the resort a few days before you arrive (no more than five days) as a reminder, but please be aware that Disney will not guarantee any locations apart from on specific medical grounds. 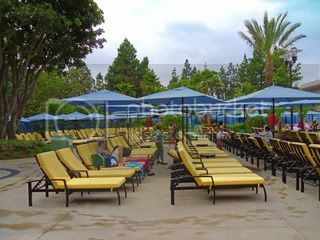 Generally speaking, because of the shape/size of the resort, all Towers have fairly equal access to the pool / dining / recreation area, as well as equal distance to Downtown Disney and the Parks. 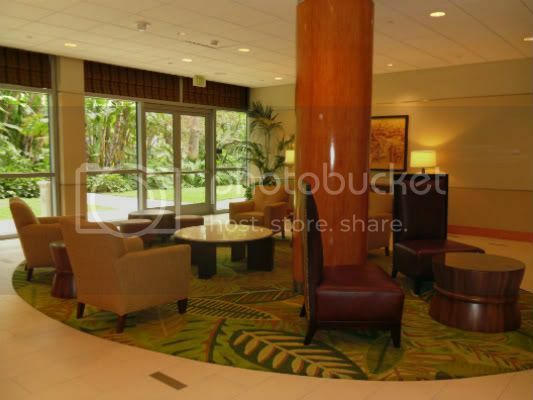 However, the closest rooms to Downtown Disney and the Park entrances are in the Fantasy and Adventure Towers. Some disabled-access rooms are available which mostly feature one King-size bed, a roll-in shower and wheel-chair height accessible facilities such as safe, wash basin, etc. 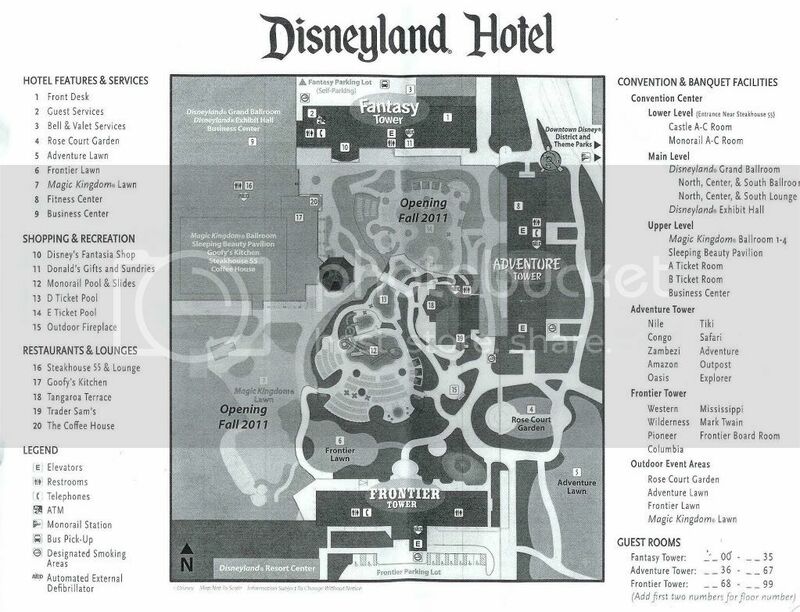 No, smoking is no longer permitted in any part of the Disneyland Resort, apart from specially designated smoking areas which are clearly marked on the resort maps. dinners and particularly its steaks, many fans also rave about its lesser-known breakfast experience. (with pool views) are available, and live music is often performed outdoors at night. A wide selection of premium coffees and pastries. 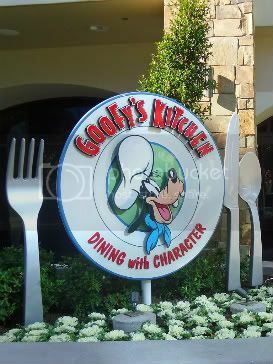 Great to drop in for a quick bite prior to heading off to the parks in the morning. 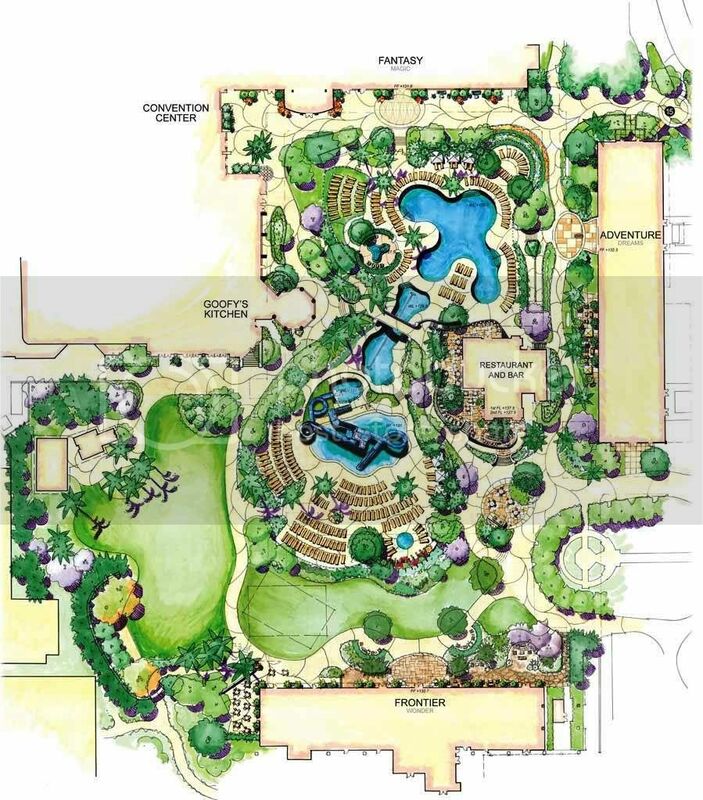 What options are available for recreation? The new pool area has a retro Disneyland look and feel. 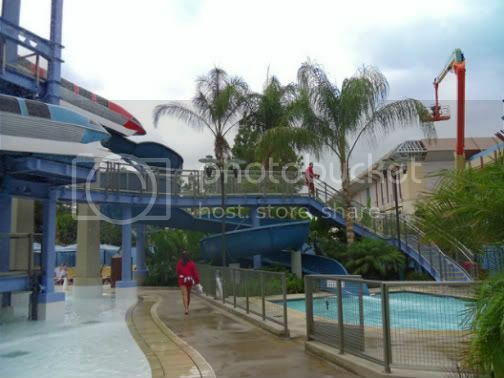 There are 2 slides at the Monorail waterslide, as well as a smaller kiddie slide. Poolside cabanas are available at an additional charge, and they feature wireless Internet access, refrigerators and flat- screen televisions. More information and photos of the pools are available in post #3 in this thread. Team Mickey's Workout Room is the on-site fitness center and is available to all hotel guests. The Center features exercise bikes and treadmills, free weights, and various other weight machines as well as TV monitors. 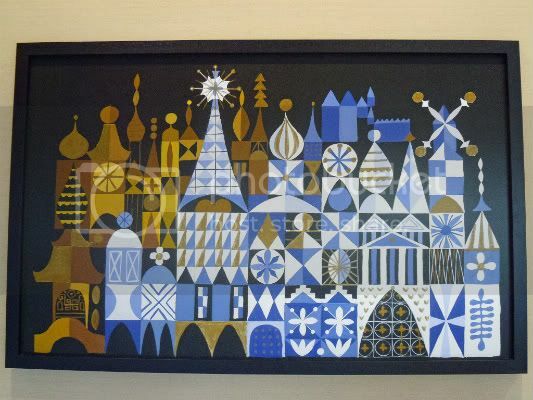 Additionally, guests of the Disneyland Hotel can also utilize (for a fee) child care in Pinocchios Workshop, and spa facilities at the Mandara Spa, both located at the Grand Californian Hotel. Can I get early entry into the parks? Yes, in certain situations. 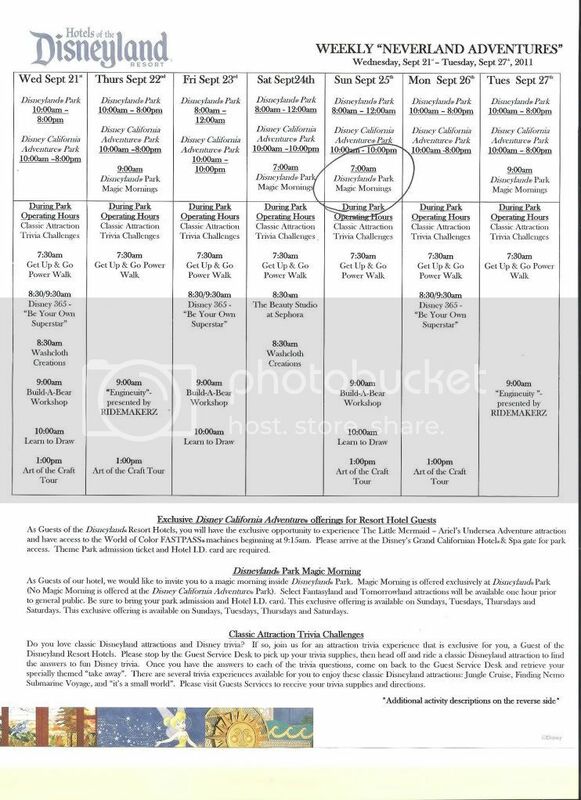 The Disneyland Resort offers a Magic Mornings program which currently offers early entry into Disneyland park on certain days (currently Sunday, Tuesday, Thursday and Saturday). Check with the hotel to see if your tickets/package allow Magic Mornings, because it is not currently offered every day of the week. 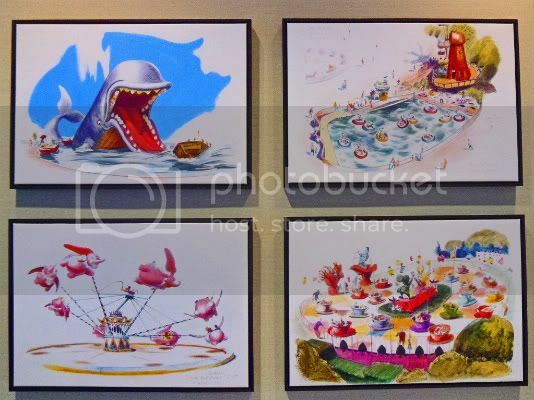 It is rumored that upon completion of its major overhaul, Disney California Adventure park will also begin participating in the Magic Mornings program. The Disneyland Resort in Anaheim is what they refer to as a pedestrian park, i.e., there is no tram transportation between the hotels and the parks. 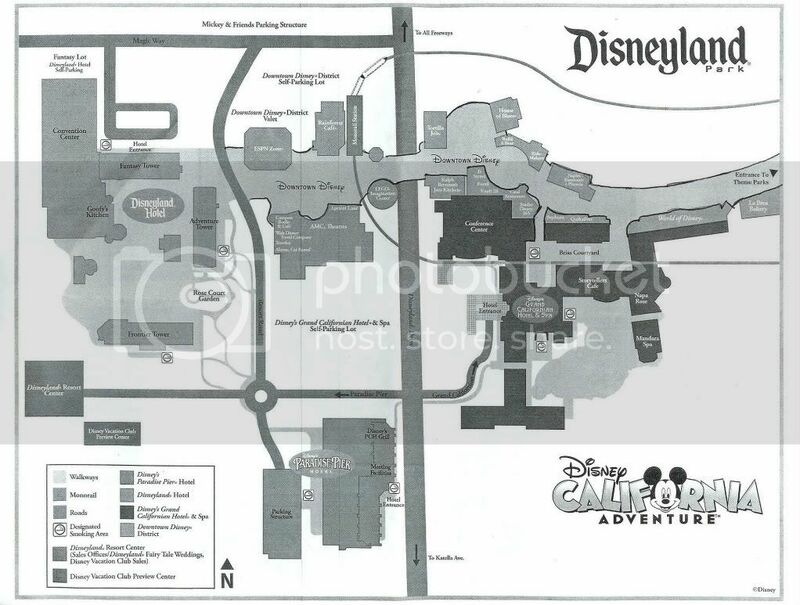 However, the Anaheim resort is much more compact than Walt Disney World in Florida, and therefore the parks and Downtown Disney tend to be about a 10-minute walk from the Disneyland Hotel. 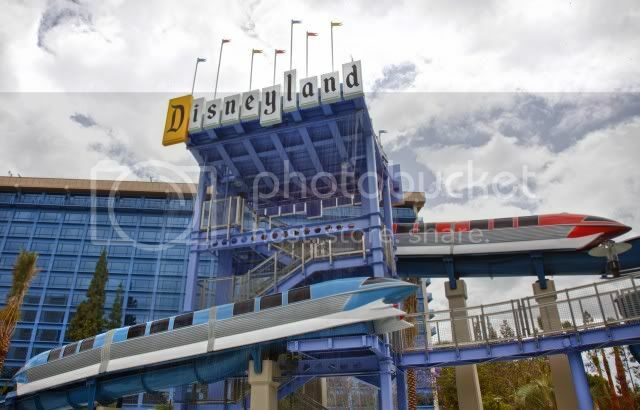 As mentioned above, Disneyland park guests can also take the Monorail into the park. The out-of-park Monorail station is about a 5-minute walk from the hotel. 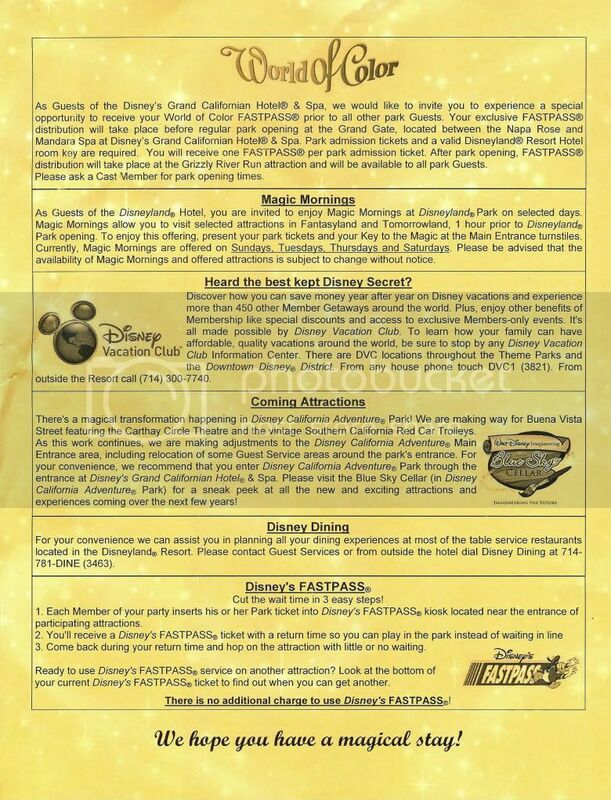 However, one must have and show a park admission ticket in order to be allowed entrance into the Monorail station (i.e., it is a different transportation system than in Florida, where anyone can hop on a Monorail without a park ticket). 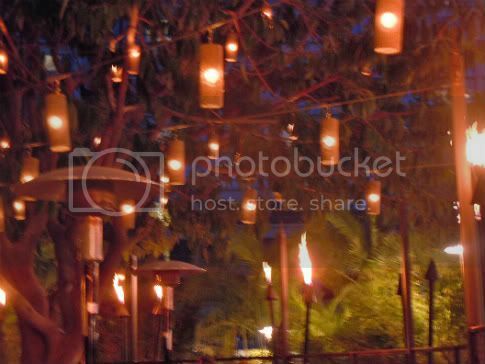 Got any photos of holiday decorations? 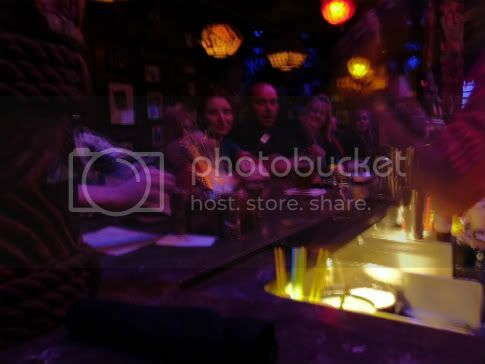 All photos are publicly available online, or else have been submitted/use permission granted. 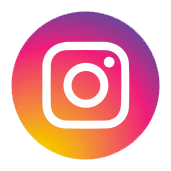 If you have photos youd be willing to share with the thread, please notify me by private message, or feel free to post within the thread. 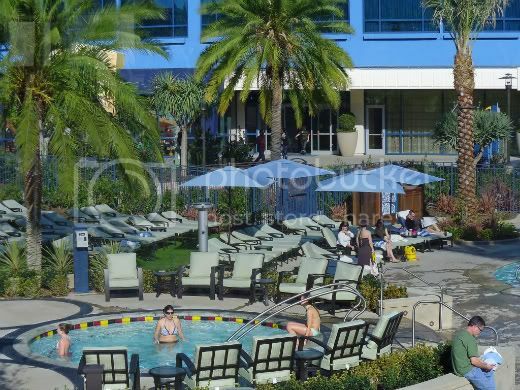 Located in the center of the hotel's "square," the monorail slides, the splash pool and the D-ticket pool are now open. From bottom-to-top is the E-Ticket pool (left) and the Mickey Mouse spa (right). 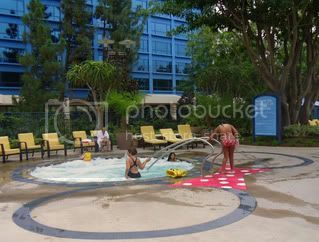 The center pool is a partial view of the D-Ticket pool (the rest of the pool is blocked from view by the bridged walkway), and the Monorail slides, Minnie Mouse spa and kid/splash pool are in the background. 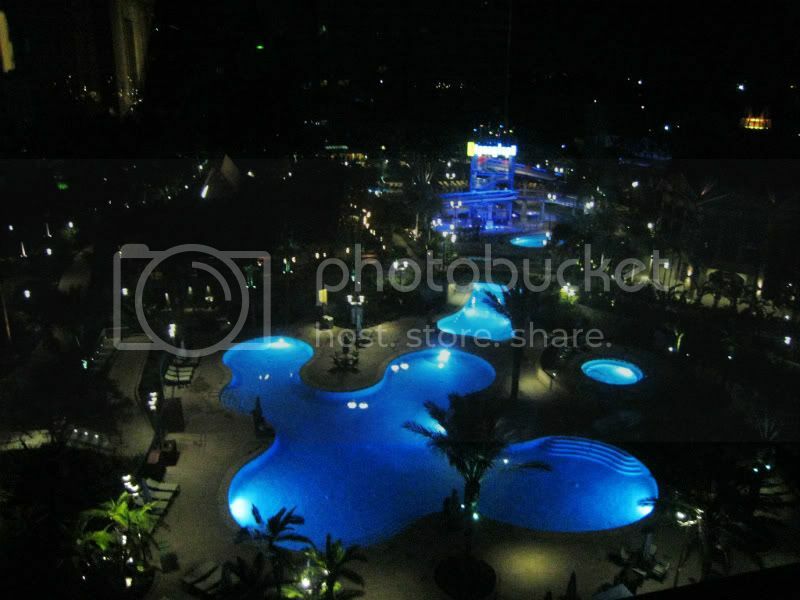 The E-Ticket pool is the largest pool, and it lies at the corner of the Fantasy and Adventure Towers. 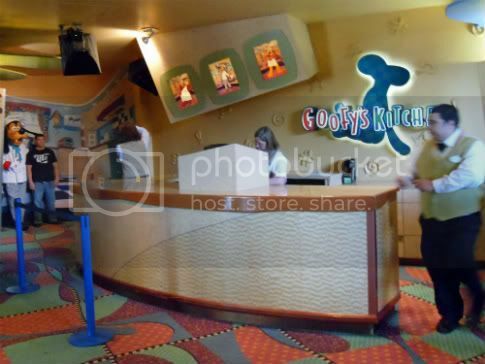 The Mickey Mouse Spa lies closest to Goofy's Kitchen. The entry for both is near the Fantasy Tower. 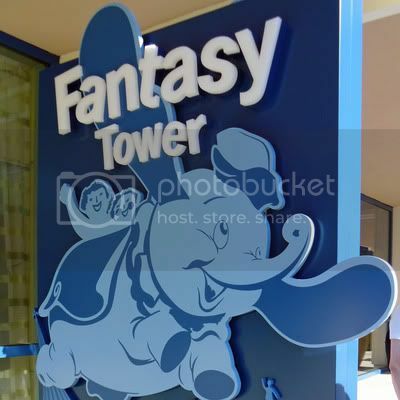 Photo taken from Fantasy Tower entrance. 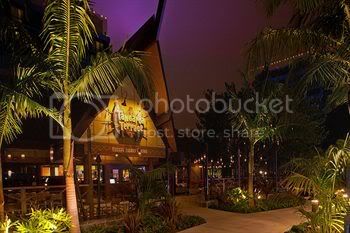 You can see the thatched roof of Tangaroa Terrace in the background. Photos taken from bridge walkway over the D-Ticket pool. 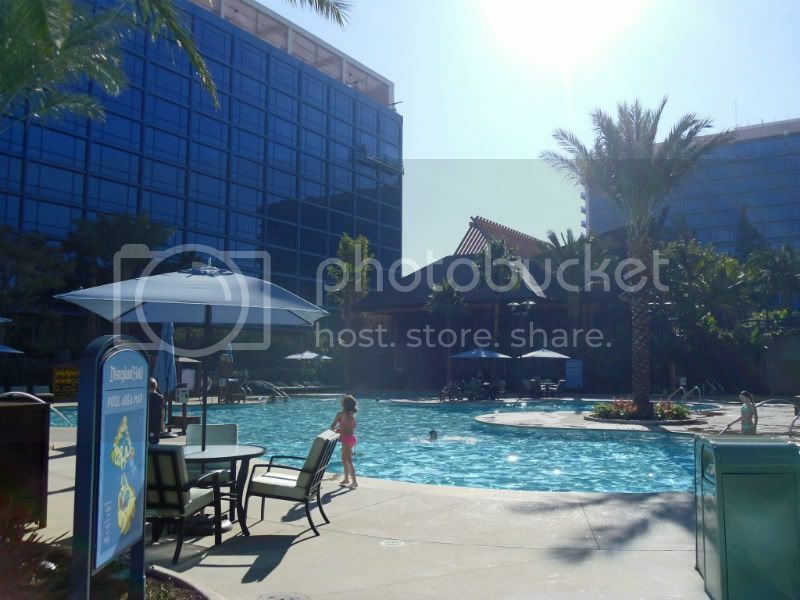 From left-to-right: Mickey Mouse Spa, and E-Ticket Pool. 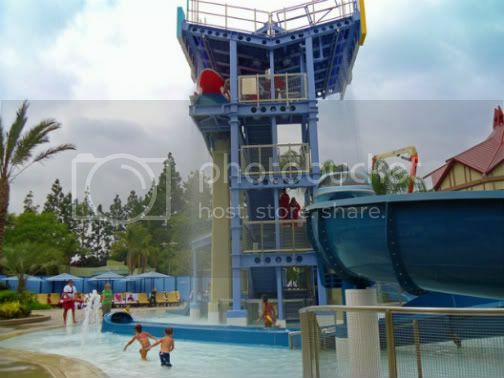 The lifeguard chair at the bottom of the right photo is facing the D-Ticket pool. 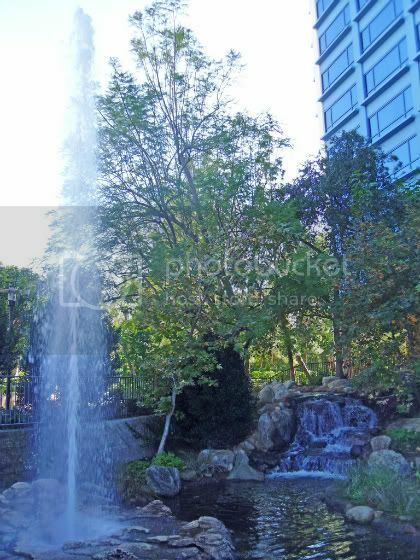 From left-to-right, here is the view as you walk into the pool area entrance located closest to the Frontier Tower. The monorail structure has three slides. 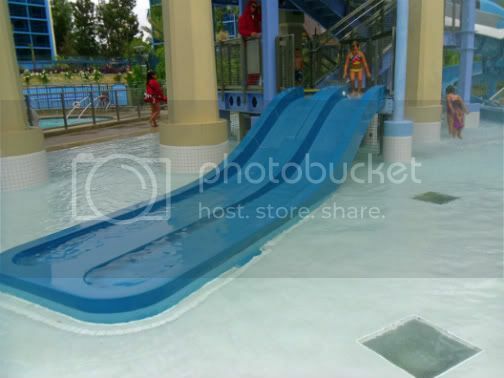 The kid slide and the Blue Monorail slide both "land" into the splash zone, which is only a few inches deep. 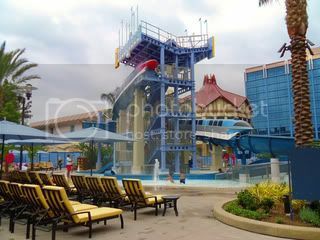 The Red Monorail slide is the biggest slide and lands in its own splash pool (approx 3-4 ft. deep). Don't even try to keep your hair dry. See all the water falling from the Monorail structure? You have to walk under that water to get to the slide stairs. You will get wet. The D-Ticket Pool is the center pool. It is oddly-shaped and therefore very difficult to photograph. 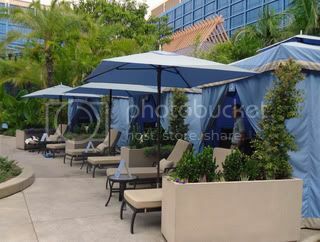 A nice feature of this pool is that it travels underneath a central bridge / walkway, and serves as the connecting pool between the Monorail Slides and the future "E-Ticket" Pool (photos were taken during construction, hence the blue walls in the background). 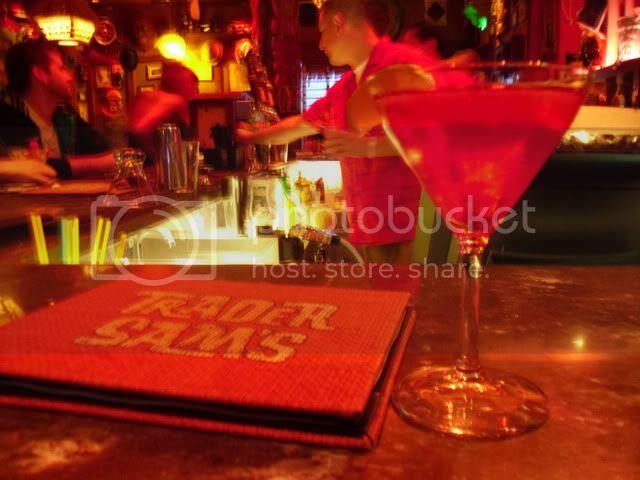 Trader Sam's is a small bar with a small appetizer menu and a big drink menu. 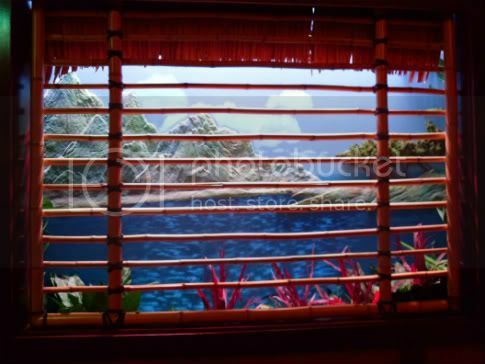 It features fun tricks and jokes from Adventureland, including "windows" showing a nearby volcano that erupts when certain specialty drinks are ordered. 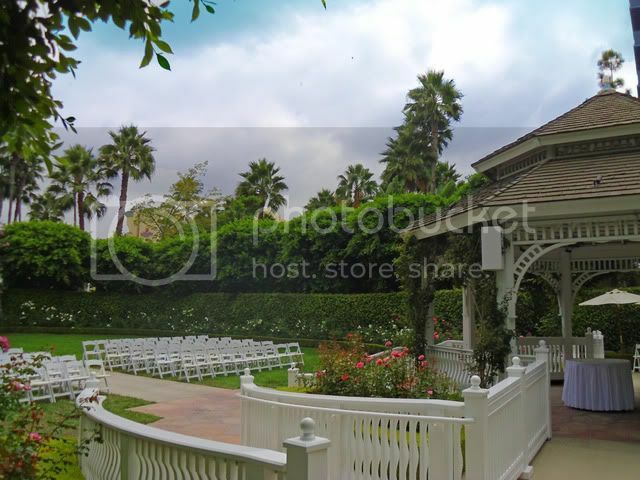 Located at the corner of the Frontier and Adventure towers, the Rose Court Garden is used by Disney Weddings, as well as a lovely little spot for photos. 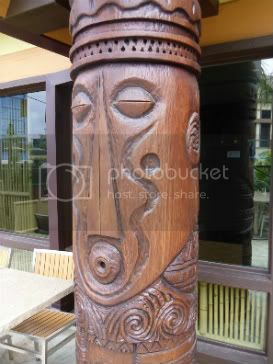 Located on the North Side of the property, the Fantasy Tower also hosts the reception / check-in area. 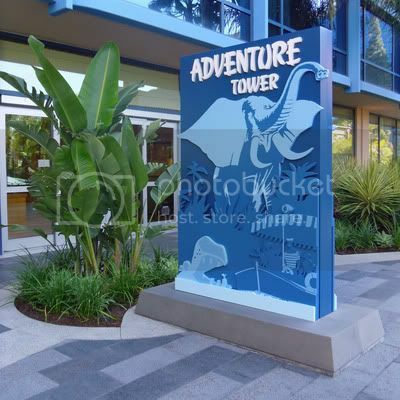 Located on the East Side of the property, the Adventure Tower is a preferred tower because it is closest walking distance to the parks and Downtown Disney, and Disneyland fireworks are viewable from some rooms. 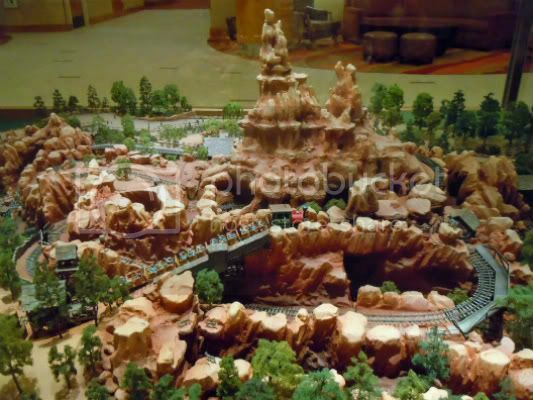 Located on the South Side of the property, the Frontier Tower is closest to the Monorail pool entrance, and features a "geyser" outside the tower entrance, as well as a scale model of Big Thunder Mountain Railroad on the lobby floor. 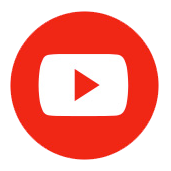 Placholder for future reviews / links. 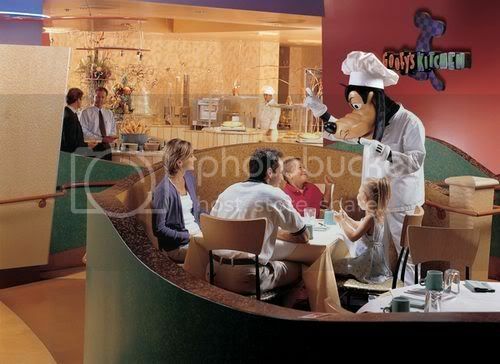 You know, I could be wrong but I think one of our mods, Mary Jo, created a thread dedicated to the Disneyland Hotel a long time ago. I will have to look it up. It wasn't called a superthread at that point but it was all about the DLH. I am pretty sure I've seen it float to page 1 every so often. Sherry, there is an old thread, but it has a lot of outdated info--at least if it is the big DLH thread that I'm thinking of. It's this thread - http://www.disboards.com/showthread.php?p=8295554#post8295554 - it was started a long time ago, but there have been posts in it more recently, I think (either that or a different DLH thread). 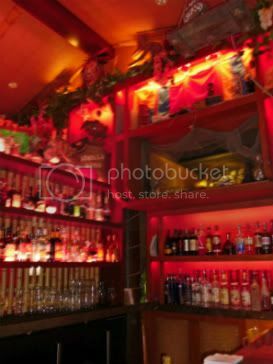 I'm sure Mary Jo won't mind....but seeing that she's one of the mods here, it might be a good idea to check with her before starting a hotel superthread like this, just to be on the safe side. I didn't realize we needed permission to start threads? If so, would you please let me know how I go about doing that? Or should I rename the thread? 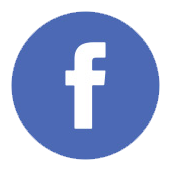 If you question a decision that's made at any point, feel free to PM us. I already explained what I meant to Purple Opal in a PM, and Mary Jo has probably been in contact with her too. It's all been cleared up. I wanted to check with Mary Jo first - and Mary Jo agreed with me that it was the right thing to do for me to ask her first. When someone spends time on/puts work into a thread like a Superthread (or an equivalent), which involves all kinds of fact-gathering, information-compiling, research, etc., we don't want to step on anyone's toes by negating all of their work and starting a brand new thread, especially if they are still active on the forum. 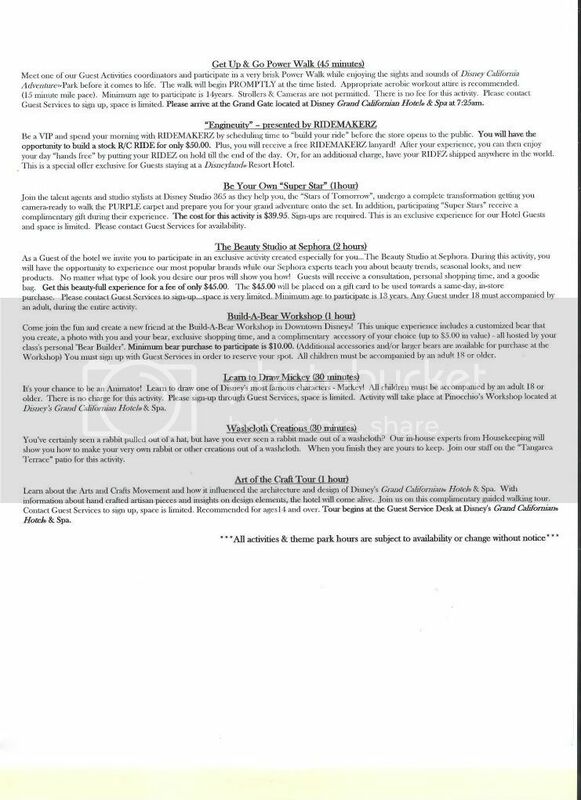 I was not sure if Mary Jo had planned to update her DLH thread at any point in the near future with the new hotel information - it was a possibility. I wanted to check with her first. Also, another scenario could be that sometimes we - as mods - might have someone lined up to work on something behind the scenes. (For example, someone may come to us and ask if it's okay to start specific check-in threads and we may tell them "Yes! 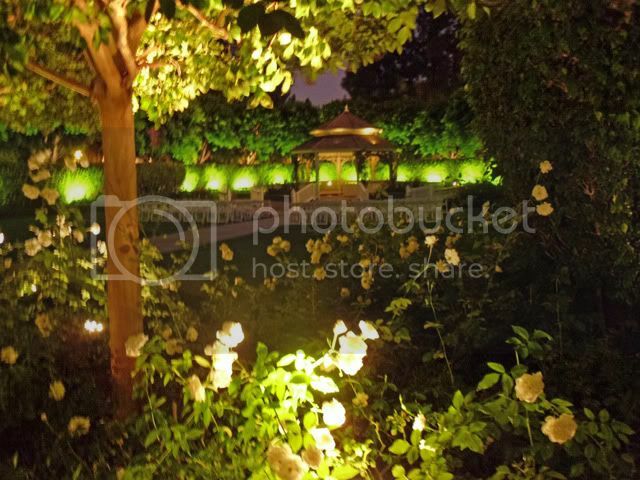 Go ahead," but the people on the forum are unaware who is lined up to do what.) There could be discussions happening or decisions made behind the scenes that you are unaware of. You just never know. Finally, if there is more than one thread that exists on a certain subject - for example, if someone suddenly decides to start a new World of Color Superthread when HydroGuy has a perfectly good one in existence; or someone starts a new November Check-In thread when we already have one that exists - we get to make the final call as to whether or not we only want one thread to exist on a certain subject. 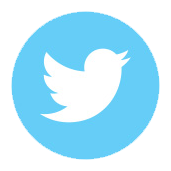 In certain cases, we may only want one or two threads about a certain thing (like one active Picture of the Day thread, for example). We don't have to make that kind of call a lot, of course, but we can make that call if necessary, and we would hope that our forum members support us as well as trust our moderation decisions. Thanks for starting this thread! Very informative and I love all the new photos. nana50 Always planning my next trip to Disneyland. I love the new updated thread. I was wondering, looking at the pools. Is there only one tiny jacuzzi way at the end?? I love this thread!!! I've been looking for updated info on DLH, which is my favorite. As of right now, though, I'm not sure about the new pool area. It's hard for me to tell by the diagram, but it looks like there isn't much pool left? 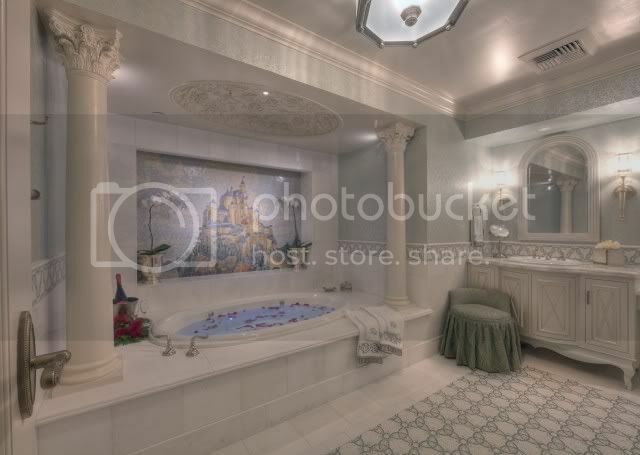 And I second what nana50 said--is there just one tiny spa?? 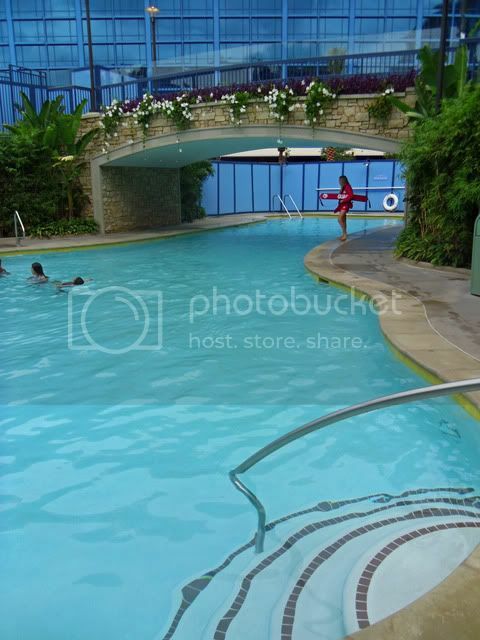 I know the pool area may still be under reno, but are there any recent pictures to show what it looks like (other than the water slides)? Love this thread! We're going in December so I'm really looking forward to hopefully lots more pictures of all the new progress! Thanks for the info. Excited for our first onsite hotel stay here. Recommendations for tower to request? 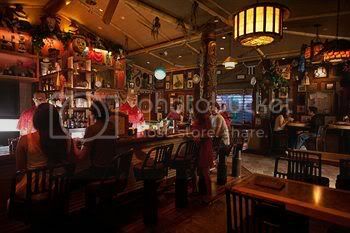 We'll be visiting the DLH this weekend for the first time since the remodel. I'll try to get more / better photos of the pool. Any other requests? We'll try to fit them in! 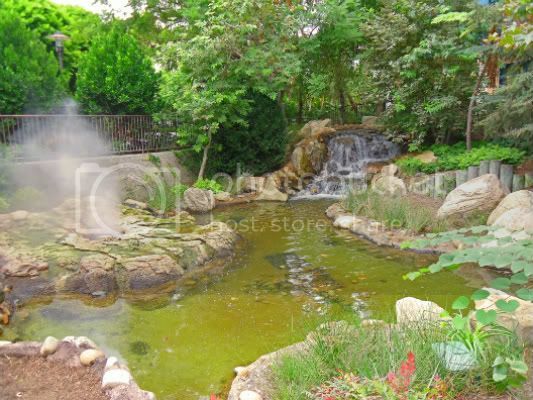 Currently there is one spa--it is fairly large though. I was impressed at the number of people who fit into it. It is not restricted to adults only though and many children find their way into it. I agree..this is a great thread! 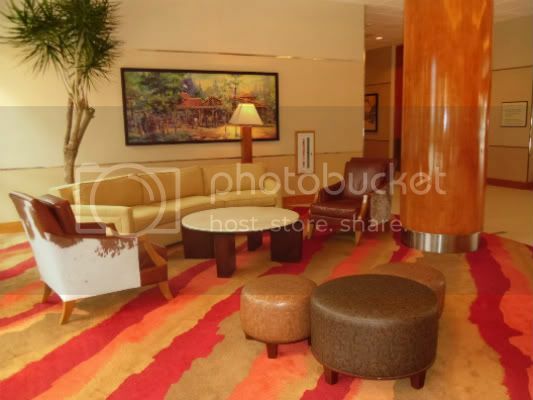 DLH is my favorite DLR resort, though I think I may be partial becuase it is the ONLY onsite hotel I have stayed at! 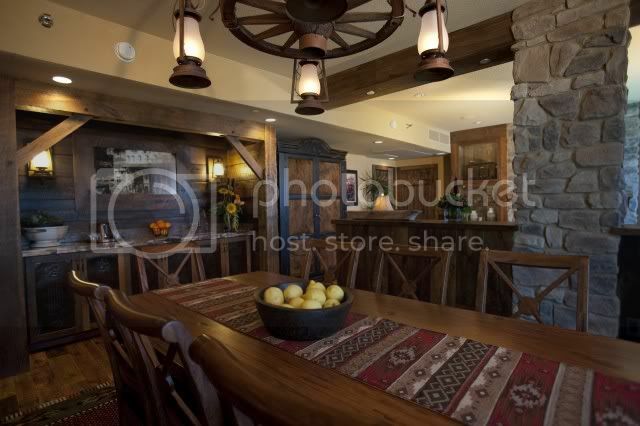 I love the nostaligic theme of the place and am glad that with the renovation they chose to keep that theme in mind! I will see the new rooms for the first time in a few months! Can't wait! 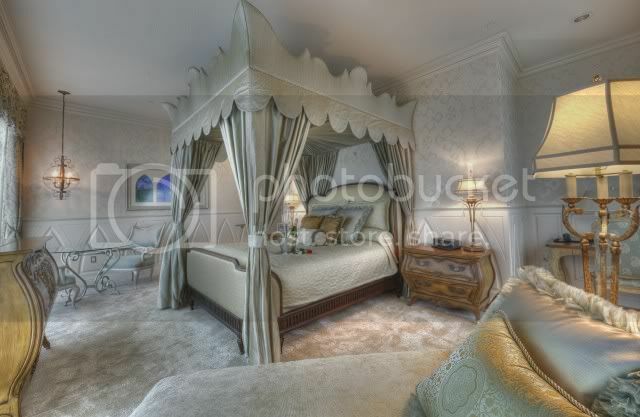 I am curious as to how much the suites cost per night? 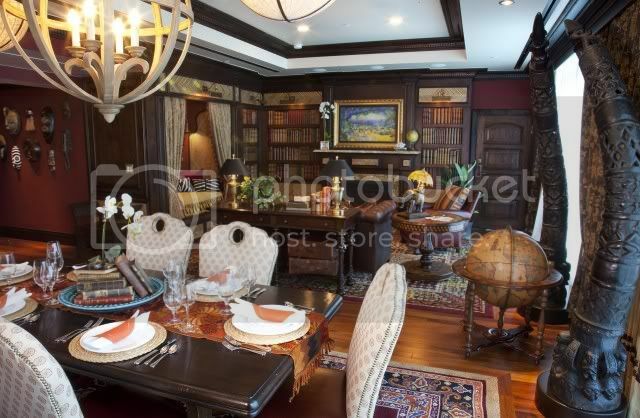 I know that Mickey's Penthouse is quite pricey! !